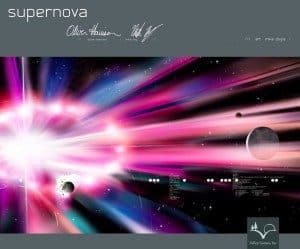 Supernova is a game of space expansion and exploration. 5 civilizations are abandoning their solar system to escape the upcoming supernova of their sun. Conquer new solar systems by taking over planets, mining moons, and building the most powerful fleet of ships by upgrading your Weapons, Shields, Communications or Engines. Capture the most space by the time the star goes Supernova to be proclaimed the winner! The combat system is a simple card driven system that is quite possibly the simplest yet most elegant space combat system to date. This game features some set collection, area enclosure and tile placement on a completely modular board. Play a short or a long version of the game without changing the board. Possibly the first space exploration game where 3D space not only matters, but could be the key to your victory! Complete artwork by Mike Doyle. This is a 3 – 5 player game with a playing time of approximately 120 – 180 minutes.